It is ironic to consider a temple could be in need of purification. The very purpose of a temple is to function as a place of spiritual cleansing. 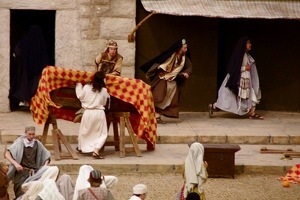 But in Jesus’ day, the temple of Jerusalem had become a den of robbers. Although it could be argued that out of practical necessity the religious authorities were motivated to help traveling pilgrims with the sale of animals and money exchange, the reality was that due to greed financial abuses were being conducted in the temple. The place chosen by God for the purification of the people had become associated with fraud and thievery. For this very reason, Jesus entered into to temple to cleanse it from its impurities. But we should not think Jesus’ actions on this day reflected an impatient response fueled by anger. On the contrary, considering Jesus was the Son of God and the many times he had visited the temple of Jerusalem in his life and ministry, it is admirable to think how long he had refrained the zeal he felt for his Father’s house. As we remember Jesus’ last week on earth, it is important to consider he came to replace a religious system that had long been broken. Although the law was good on account it had been given by God, the religious authorities of Jesus’ day had corrupted the sacrificial system. Thus, the purification of the Temple points to the need for us to turn to Jesus in true repentance and seek him with all our heart, for he alone can purify our lives from sin.